We have a winner for the….. 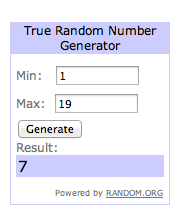 Thanks to random.org #7 is chosen. *on the back end of my blog I can go see the time in which each of these comments were placed. Starting with the very first comment on Friday through today #7 is Kristin Necaise.